A perfect setting for a Summerhouse, this Weybourne has been installed on the edge of our customer’s large stretch of land in Brinkley, Cambridgeshire to sit in and enjoy the surrounding landscape from, all year round. All of our high quality timber buildings are handmade made in our factory in Norfolk from FSC® certified Scandinavian Redwood. 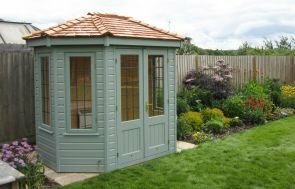 The customer chose the following features for their summerhouse: cedar single tiles on the roof to add more of a natural element to the structure, the windows are all leaded in style and the summerhouse has been painted in the colour Verdigris, from our exclusive Valtti Paint Palette. This Weybourne is highly suited to year-round use, as it has double glazed windows, an electrical pack, painted matchboard lining on the internal walls, and full insulation. 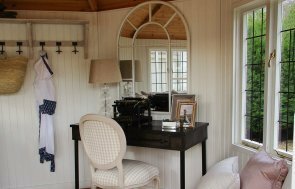 This is one of six Summerhouse options, the others include: The Wiveton, The Cley, The Blakeney, The Holkham and The Morston. We also have a traditional range of Summerhouses, the National Trust Summerhouse Collection. Do you want to view our Garden Buildings in person? If so, you can visit one of our Seven UK Show Centres where you can browse a selection of display buildings. This can help you to identify the building of your dreams. 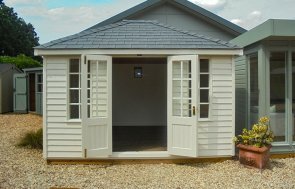 If you would like more information about our full range of Summerhouses, follow the link shown below.